My lawn is a four-minute mowing job. The length of the task barely qualifies for being worthy of documentation, but the lack of such a photo in my albums would puzzle my descendants. I come from a line of Americans intent on posing with their lawn mowers, snow blowers, and shovels. 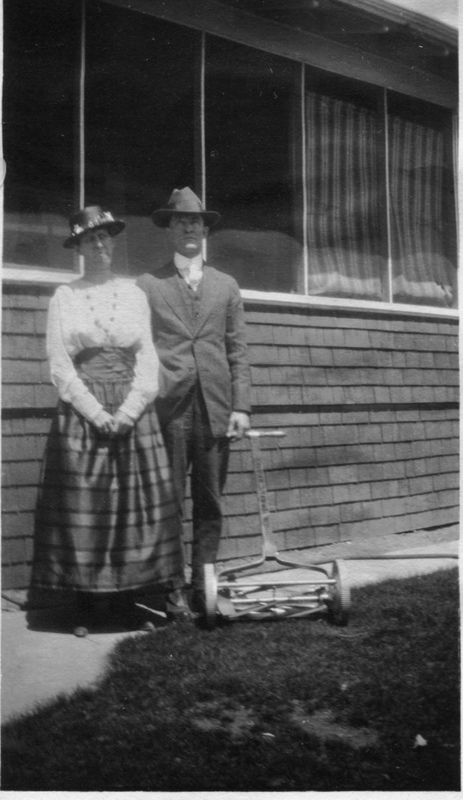 My distant relatives Arvilla and Walter Jones (below), are dressed in their church clothes for a formal portrait with their reel mower. I think a good title is Patriotism with a Mower. 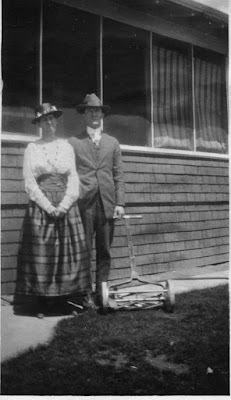 Early lawn mowers, designed and constructed in the 1830s in England, were made of cast iron. They were so heavy that they often required one person to push and one to pull – giving them the moniker of “man and boy machines”. 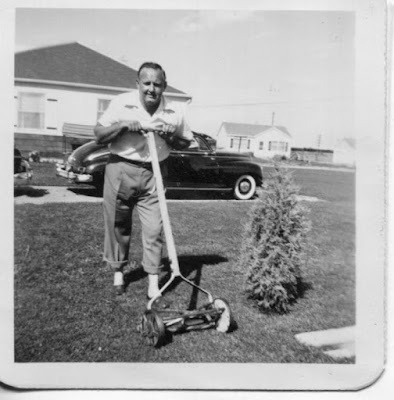 My dad loved mowing. He enjoyed being outside, getting some exercise, and basking – in a humble sort of way – in the quiet admiration of his family, neighbors, and passing cars. He loved all aspects of yard care. Seeding, sodding, thatching, fertilizing, watering, and weed killing. But the American family pastime, yard care, was deceptively complex. “My, my, your children are growing like weeds,” said uncles, and neighbors, and the men at the hardware store. Patting us on our summer-bleached hair, our heads soft and golden as dandelions, the salesmen at the hardware store touted to my dad the merits of the best and latest in weed killers. We shook our tousled golden heads in puzzlement. Adults were so odd. The chemical and pesticide firms were led mostly by men back then. Their marketing efforts touted the glories of green grass and robust flowers. They printed on the labels in type, as tiny as the edge of a blade of grass – if they did so at all – the unpronounceable names of poisonous ingredients and their hazards. They hoped the buyers would associate size with significance. The sound of lawn mowers, baseball announcers, and the clink of ice cubes was the fond background noise of my childhood and youth. Only later, when cancers became common and I owned my own lawn, did I decide to cautiously use weed-killing chemicals. My quarter-acre lawn was never the dense and bright green field of a well kept yard, but I mowed and pulled dandelions by hand. It was my neighborly duty. Some might say patriotic duty. 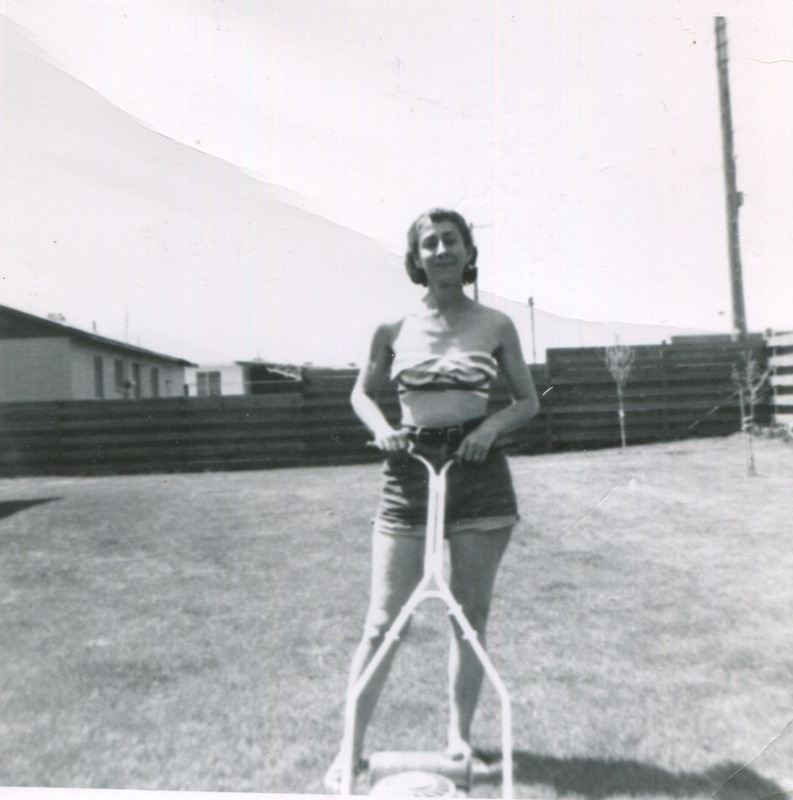 By the early 1950s, reel mowers were replaced by lightweight, gas-powered lawn mowers that "even women could use”. A gas can became a necessity in every American toolshed or garage. I didn't often see my mom (above) mowing, but she loved wearing the gardening clothes the American fashion began marketing for the modern, suburban woman. Shorts, capris, halter tops, and tennis shoes appeared in catalogues and local department stores. They were a boon to the clothing industry. Although girls rarely mowed, they wore similar outfits as their mothers. The style of clothing suggesting that being active was okay for females. 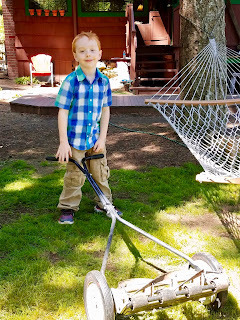 Meanwhile, men and boys began wearing their t-shirts (formerly their underwear) as outer wear for doing the yardwork. The style gained favor up and down the social order, making it harder to discern someone’s economic standing. A very democratic move. 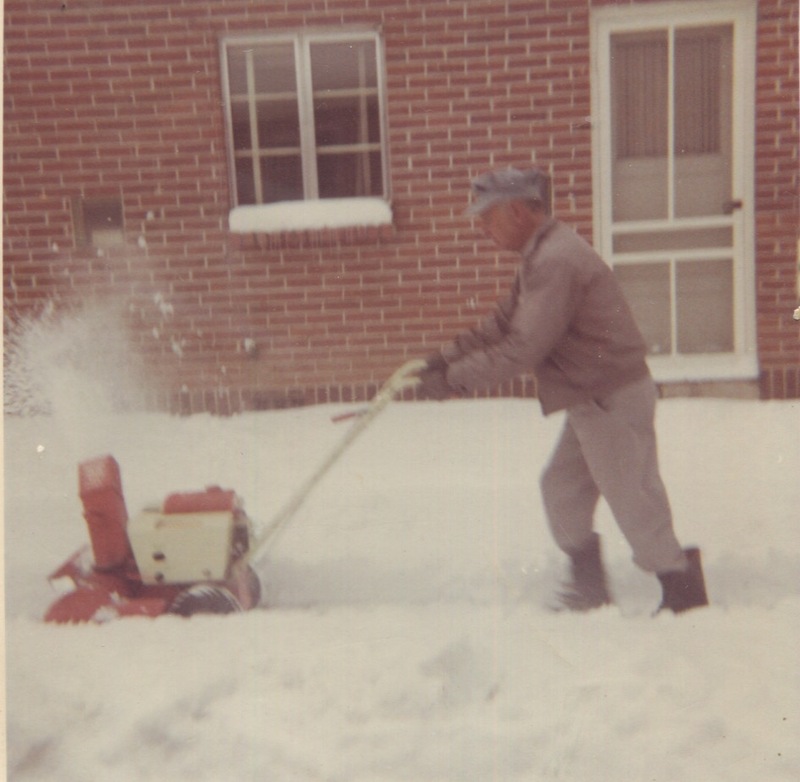 In the fall some of my family used leaf blowers and in winter snow blowers (like my Uncle Ted above). They all celebrated the machines that made us proper American citizens. There is much to admire in yard care work: the ingenuity of the inventors, the production of the machines, the creativity of the chemists, the changes in clothing for women and men, and more recently the leg-up to becoming citizens for hardworking (primarily Hispanic) lawn maintenance crews. But there is a downside. America now has over 40 million acres in lawn. An astonishing figure! Every weekend approximately 56 million Americans mow their yards using 800 million gallons of gas a year. Gasoline spilled, when tanks are filled, pollutes groundwater. The inefficient, small engines emit pollutants into the air and also contribute to noise pollution and hearing loss. 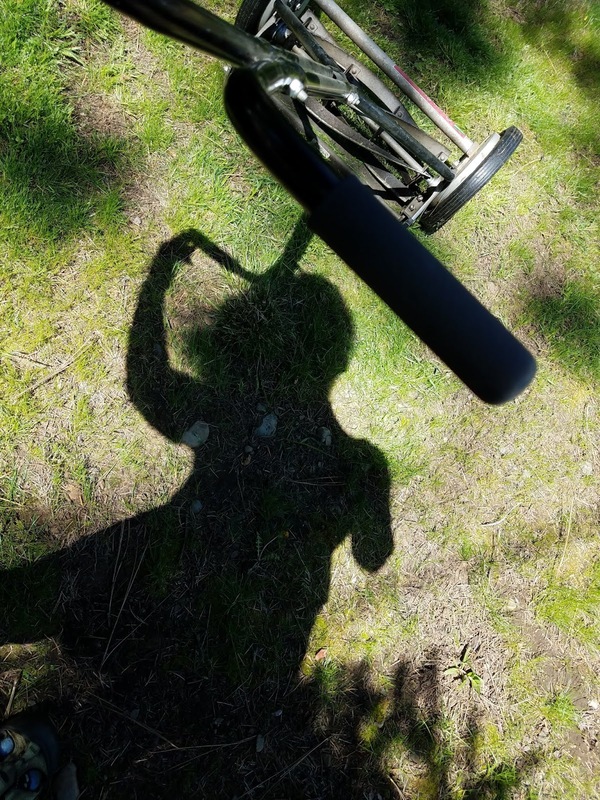 (Facts from Clean Air Yard Care, 2018) Moreover, as riding mowers gain a majority of the mower market, the earlier benefit of aerobic exercise decreases. The next generations of Americans will be challenged to redefine the look of yards or how we care for them. Chemical companies are already working on growth-inhibiting products for grass. Solar-powered mowers are becoming available. This little guy, in the meantime, is learning to mow my four-minute lawn with a reel mower. Documentation of mowing machines continues in my family. We are not done with lawns, yet. We might not have a flag to wave, but we have mowers to push.